Betway is a sportsbook that features online sports betting. Bringing you fun and convenient ways to bet on your favorite local and international sports. Their wide variety of betting options allows you to make wagers anytime in a safe and secure environment. Betway is available online and in app form for Android and iPhone. At Betway, you’re treated to a wide variety of secure banking options letting you make transactions easily. For your convenience, Betway has integrated Mobile Money so you can transfer funds from your Mobile Money account to your Betway account. Moreover, you can make deposits using Visa, Bank Transfers, Tigo Cash, and Airtel and M-Pesa mobile money wallets. In terms of currency options, you can make your deposits in Australian, Canadian, New Zealand, and United States dollars. There are also options for Swedish, Denmark and Norwegian kroner, Russian ruble, Euros and British pound. Betway allows a 100% match bonus of up to $50. In addition, you can take advantage of their Welcome Bonus of 100% up to $20,000 NGN. You also get incredible perks like their Betway Rewards program. With Betway Rewards, the more points you collect, the more you get for your money. The program’s tier status means that once you collect the required amount of points, you’ll be eligible for great status benefits. Football (soccer), rugby, cricket, volleyball, hockey, horse racing, and even golf is available for you to bet on. Betway also provides odds for lesser known sports like darts, cycling, table tennis and snooker. There’s Formula 1, UFC and entertainment picks like TV show odds and politics. There’s something for casual bettors looking to place their first wager on football, and cricket aficionados hoping to win big on the IPL Final match. What Casino Games are Available at Betway? If you need to take a break from betting on sports, you can check out the Betway casino. You’ll find the usual online casino fare like blackjack, roulette, slot machines, Texas Hold’em and baccarat. You can also find video poker variants, live dealer games, bingo and online scratch cards. If you’re unsure as to where your money goes if you lose a bet on Betway, you’ll be happy to know that you’re helping fund many charitable initiatives. Betway takes on international exchange programs that provide kits and benefits to players and coaches. The Kenya Kayole Starlets were one of recipients of Betway’s kits and equipment. Moreover, Betway sponsors West Ham United, the football club from the United Kingdom. Now that the Betway brand has made a successful name for itself, the company continues to sponsor African players as they make their mark on international fields. In keeping with their charitable nature, Betway sends their efforts and resources to uplift communities around the world to encourage sports development. Furthermore, the Kenya Red Cross Society and the Joyful Women Organization were gifted a hefty sum. Also, the Gulu Referral Children’s Home in Uganda and the Juvenile Rehabilitation Centre received a large donation of food items. Finally, Betway has given support to Nagura General Hospital in Uganda and they are a proud sponsor of the Ghana-based Ashanti Gold Football Club. What are the Pros and Cons of Betway? Betway has many pros and unfortunately some minor cons. Although, for most online bettors, the pros outweigh the cons which explains why Betway is one of the more popular sportsbooks in the world. As with any sportsbook, Betway provides new users a substantial Welcome Bonus. Another pro of this sports betting site is that they offer horseracing which is a very popular sport across the world. You can also take advantage of their live betting options and use their in-play feature to place wagers even while the event is taking place. When it’s time to collect your funds, their Cash Out option lets you claim your money even if the event is still going on. You can actually take your money out of the bet even if the results haven’t been announced. The problem that some people have with Betway is that it is not available to American bettors. However, if you live in Africa (or basically anywhere else in the world) you will have no problem getting onto the site and making wagers. Additionally, some of their promotions contain too many terms and conditions. While, this does not affect everyone using Betway to make sports bets online, if you are a serious bettor and not using the site to casually make wagers, ensure that you read everything so you can properly use the promotions that are offered to you. 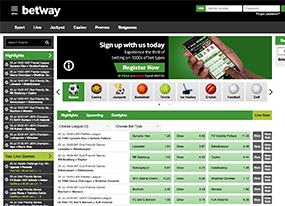 Betway’s online sportsbook is available in the following languages: English, Swedish, German, Norwegian, Finnish, French, Danish, Spanish, Italian, Portuguese, and Russian. For bettors in Africa, Betway could prove to be the best sportsbook for your betting needs. The quality of their odds and multiple deposit options available are what users find the most satisfying.